Could partial dictation be a happy medium for physicians disenchanted with documenting in an EHR? If you had to write your EHR memoir, it might go a little something like this: Your hospital chooses a vendor. You begin the arduous journey toward implementation. You have high hopes of obtaining physician buy-in, achieving greater efficiency, reaping financial incentives, and ultimately providing better patient care. However, this utopian vision quickly becomes a nightmare as physicians lament the need to insert information using rigid templates. The quality of documentation decreases, and even your reimbursement begins to suffer. Unfortunately, experts say this isn’t an exaggerated picture of doom and gloom in some hospitals. It all goes back to whether physicians view an EHR as an impediment or an enhancement to patient care, says Sherry Doggett, director of corporate transcription services at UC Health, a large teaching facility in Cincinnati. If the EHR doesn’t interrupt workflow and actually makes tasks easier for physicians, they’re more likely to naturally buy into it, she notes. “Physicians want choice,” Doggett says. Although some don’t mind using drop-down menus and templates to enter information, they’ll continue to want the ability to dictate for patients whose circumstances are more complicated or unique. Although some EHR vendors may argue otherwise, forcing physicians to abandon dictation entirely isn’t the answer, she says. So what is the solution? Can there be a happy outcome? The desired results are achievable, Doggett says, permitted physicians can enter information into the EHR using a method of their choice: either manually or via dictation. This a la carte model—referred to as partial dictation—gives physicians the ability to quickly enter certain data manually using drop-down menus, check boxes, and templates within the EHR while also being able to dictate as necessary. The technology can be used with traditional transcription or front- or back-end speech recognition. If physicians choose to dictate, they simply click a dictation button/icon while in the body of the template, grab a microphone attached to the workstation, and begin to speak. Health Level Seven International (HL7) interfaces insert the content directly into the appropriate section of the EHR. Physicians also can use a traditional telephone or mobile device when dictating. In those cases, information is automatically routed to the EHR, at which point a healthcare documentation specialist takes over to transcribe the information via a text platform or directly into the electronic record. Data transfer via XML files and HL7 interface technology handle the “behind-the-scenes” integration to make this a seamless process. In similar models, such as those that rely on discrete reportable transcription, physicians dictate all reports and don’t use any templates or drop-down menus within the EHR. That’s because data are extracted from transcribed text and automatically populated into the appropriate EHR fields. 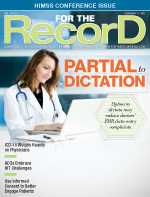 Discrete reportable transcription minimizes workflow changes for physicians, ensures detailed documentation, and encourages physician satisfaction, says Susan M. Lucci, RHIT, CHPS, CMT, AHDI-F, a consultant with Just Associates, Inc. Disadvantages of this model include longer turnaround times and higher transcription costs, she notes. UC Health recently went live with partial dictation in its inpatient setting after having used the model in ambulatory care for more than two years. Approximately 30 physicians actively use this model of data entry, and Doggett expects the number to grow commensurate with physician awareness. Those who aren’t using partial dictation continue to either dictate all information or enter it manually into the EHR. Doggett hopes that all physicians eventually will feel comfortable transitioning to a partial model that the hospital will continue to use indefinitely as a best practice. What makes partial dictation so appealing to physicians and hospitals alike? For physicians, it’s about having choices. Partial dictation allows them the flexibility to manually enter certain information (eg, vitals, current medications) while dictating the detail-rich portions of an encounter (eg, family history, medical history, treatment plan). Lucci says the goal is to allow as many options as possible to meet the needs of each physician—and patient. UC Health physicians appreciate being able to choose what they dictate, Doggett says. Specifically, they can dictate elements of the history of present illness, medical decision making, and treatment plan while using drop-down menus, check boxes, and manual typing for other information. Having choices makes them more open to using the technology in general, Doggett says. Partial dictation can help ease physicians into using an EHR because it retains traditional dictation with which physicians are already familiar, explains Judy Arrendale, president of Arrendale Associates, a technology firm dedicated to clinical documentation. Because physicians are more apt to complete dictations in a timely manner, hospitals ultimately end up with more detailed documentation that better supports patient care. “If physicians know that they can perform partial dictation, where they used to have to do an entire dictation, they may be more encouraged to get the dictation done sooner because they only have to do smaller sections of the report,” Lucci says. In some cases, partial dictation is necessary as hospitals transition to an EHR. “We find that in the beginning, a hospital may not have all the templates completed or may even phase them in, meaning for a time some or most or all patient reports are dictated,” Arrendale says. Experts say there are several reasons hospitals may start to gravitate toward a partial dictation model in which portions of the record are dictated in a narrative format. First, stage 2 meaningful use criteria specifically address and allow the ability to collect both narrative and structured data in the EHR, Lucci says, adding that the Office of the National Coordinator for Health Information Technology recognizes the importance of both formats in terms of patient care. Lucci agrees that physicians can spend their time more wisely. “One of the challenges that EHR technology has had all along is that by eliminating transcription, it places the sole burden of healthcare encounter documentation on the physician. This just doesn’t make sense,” she says, adding that transcription is a time-saver, allowing physicians to see more patients. Adopting partial dictation also can help ease the burden of ICD-10-CM/PCS demands, which include greater specificity. Templates and drop-down menus simply don’t capture the necessary level of detail, Arrendale says, adding that at some point reimbursement could be compromised if hospitals don’t take advantage of ICD-10’s added specificity. “If history tells us anything, I would be very surprised if CMS [the Centers for Medicare & Medicaid Services] doesn’t modify reimbursement models to align with specificity,” she says. The best way to prepare for such a decision is to preserve the narrative in which these important details are located, Lucci says. As hospitals undergo recovery auditor contractor and other third-party payer audits, there is greater focus on documentation quality and compliance. Auditors are looking for specific details relevant to each patient’s unique circumstances, not canned documentation or templates that may be irrelevant, Lucci says. “I think progress notes are the ideal candidate for partial dictation because you avoid the copy-and-paste dilemma altogether,” she says. The anticipated rise in partial dictation use likely will have a positive effect on healthcare documentation specialists, many of whom experience layoffs and suffer cutbacks when EHR technology is implemented. How will partial dictation affect the workflow of healthcare documentation specialists? Dictation is broken into snippets (for example, a sentence or two in the history and physical or assessment and plan), each of which is subsequently merged into the EHR. Healthcare documentation specialists will complete more jobs per day, but the total number of transcribed lines per patient visit will be reduced significantly, according to Arrendale. Another change is that multiple healthcare documentation specialists may work on various audio clips for the same patient visit. Specialists may not have direct access to the EHR, which could be problematic from a quality assurance standpoint because there is no context for the information being transcribed, says Karen Fox-Acosta, CMT, AHDI-F, president of the Association for Healthcare Documentation Integrity. “The ability to be able to discern context has changed. To me, this has significantly affected the workers’ ability to apply their critical thinking skills because they’re not seeing everything,” she says. In some cases, healthcare documentation specialists do have access to the EHR because they’re transcribing directly into it. At UC Health, for example, specialists in the ambulatory setting input information directly into the EHR. On the patient side, they don’t input directly into the EHR, but they do have access to the technology and can peruse the record when questions arise, Doggett says. Although partial dictation has many advantages, experts say several drawbacks could prevent hospitals from further exploring the technology. “When you’re talking about health information exchange and true interoperability, there is resistance from the technology side for any type of narrative because they do see it as the black hole of information, even if the text is codified in the background. It’s still so much information. IT prefers everything to be discrete data,” Fox-Acosta says. Integration with the EHR also can be complicated. “With partial dictation, you’re relying on the technology to get the text into the proper spot, so the interfaces are critical,” Arrendale says. However, technological advances have made it possible to better capitalize on narrative information, which has, in turn, spurred a movement toward preserving it, Fox-Acosta says. “With NLP [natural language processing] and other technologies, software can compute and use this information. NLP, HL7, and advances in SNOMED have all given narrative text broader adoption in the electronic world,” she says. For example, narrative text now can be used for computer-assisted coding as well as data exchange using the continuity of care document. However, that line of thinking may change as the industry places more emphasis on documentation quality in preparation for ICD-10 and other data-driven initiatives. Arrendale says hospitals or physician practices that are interested in partial dictation technology should ask their vendor whether the functionality can be coded into the software.